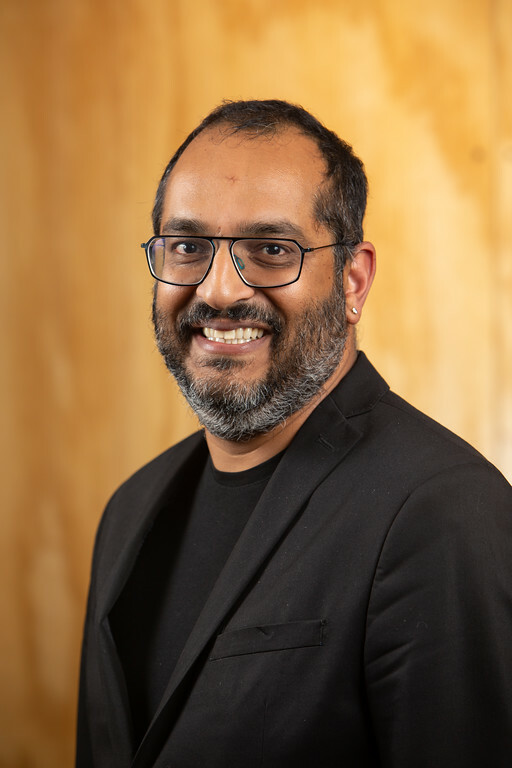 The University of Washington community mourns the loss of our friend and colleague, Vikram Jandhyala, a committed educator, innovator, and entrepreneurial leader who made a lasting impact on our campus culture and the community. In addition to his teaching and research, Jandhyala left his mark through his tireless efforts to mentor faculty and students and help translate research into real-world impact via UW CoMotion. He will also be remembered for his enthusiastic leadership of new and innovative partnerships such as the Global Innovation Exchange (GIX) in collaboration with Microsoft and Tsinghua University in China. Jandhyala began his UW career in 2000 as a professor in what was then known as the Department of Electrical Engineering (EE). He was Founder & Chief Technologist of UW spin-out company Nimbic (formerly Physware), which developed high-speed, 3D electromagnetic simulation solutions used in hardware design that was subsequently acquired by Mentor Graphics. Jandhyala served as ​Department ​​C​hair of ​EE from 2011 to 2014, during which time he also served as the founding director of the joint UW and Pacific Northwest National Laboratory Northwest Institute for Advanced Computing. He stepped down from his role as ​Chair to become the UW’s ​Vice ​P​resident for ​I​nnovation ​S​trategy and ​E​xecutive ​D​irector of CoMotion. Jandhyala was joined on the GIX leadership team by his faculty colleague, Shwetak Patel, who led the interdisciplinary faculty group that helped craft the GIX curriculum and serves as its Director and Chief Technology Officer. As director of the Ubicomp Lab, Patel has taken inspiration from Jandhyala to made entrepreneurial leadership a cornerstone of his teaching and mentorship. He has started multiple companies with students and colleagues since his arrival at the UW, including residential water and energy monitoring company Zensi, which was acquired by Belkin in 2010, and SNUPI Technologies, develop of the WallyHome wireless home sensing platform that was acquired by Sears in 2015. He worked directly with Jandhyala and his team on the acquisition of his most recent startup, mobile health sensing company Senosis, by Google in 2017. Patel credits Jandhyala for helping to convince him to come to Seattle and for supporting his career trajectory melding innovative research with entrepreneurial impact. “Vikram built an infrastructure and culture around supporting an entrepreneurial spirit that cut across the entire University,” said Patel, who holds a joint appointment in the Allen School and the Department of Electrical & Computer Engineering (ECE). “He laid the groundwork for companies like Senosis to succeed by enabling us to leverage commercialization gap funding, incubation, and other programs that flourished under his leadership. Joshua Smith, who is also a professor in both the Allen School and ECE and directs the UW’s Sensor Systems Laboratory, recalled Jandhyala’s vision and generosity in helping Smith to launch a startup company, Proprio, to commercialize a new machine-learning enabled visualization tool for surgical teams. “Vikram selflessly catalyzed the formation of Proprio by introducing me to Dr. Sam Browd, an entrepreneurial doctor who had identified a medical need,” Smith said. “I will miss his positive, enthusiastic, and generous spirit. Smith worked with Jandhyala on the successful spin-out of another two companies — wireless robot charging company Wibotic and Jeeva Wireless. The latter, which Smith co-founded with a team that included Allen School professor Shyam Gollakota, aims to transform the way we power the Internet of Things by enabling battery-free communication using backscatter technology. After spinning out from the UW, the company raised $5 million in venture capital, grants, and project funding. Gollakota also worked with Jandhyala on a deal with ResMed to commercialize the technology behind ApneaApp, which detects signs of sleep apnea, and the spin-out of health-oriented mobile sensing company Sound Life Sciences, which is commercializing the Second Chance opioid detection app. Both of those apps were developed in conjunction with UW Medicine — two more examples of the interdisciplinary innovation in service to big ideas that was a hallmark of Jandhyala’s leadership. “Vikram had a huge positive impact on education, on research, and on innovation at the University of Washington and far beyond,” said professor Ed Lazowska, who holds the Bill & Melinda Gates Chair in the Allen School. “Under his leadership, CoMotion completed UW’s transformation from ‘licensing’ to ‘commercialization’ to ‘innovation.’ And the Global Innovation Exchange combined technology, design, and entrepreneurship in a project-based, global context. Read President Cauce’s tribute to Jandhyala here, ECE Chair Radha Poovendran’s tribute here, and articles on Jandhyala’s life and impact in GeekWire, Puget Sound Business Journal, The Seattle Times, and Xconomy. If you’re thinking about suicide, are worried about a friend or loved one, or would like emotional support, the Lifeline network is available 24 hours a day/7 days a week across the United States. Call the National Suicide Prevention Lifeline at 1-800-273-8255, or contact the Crisis Text Line at 741741. Need help now? If the person you are concerned about is in immediate danger of harming themselves and/or refuses to stay safe with you, call or text 911.